LOS REYES LA PAZ, Mexico -- Only hours after the publication of an Associated Press story on his case, the U.S. government has issued a humanitarian visa enabling the return of a Harvard University student who broke immigration rules by taking his dying mother to Mexico. Dario Guerrero, 21, was born in Mexico and moved with his family to California when he was 2. The Obama administration granted him and hundreds of thousands of other young immigrants a reprieve from deportation two years ago. But these people can't leave the U.S. without government approval. And Guerrero's mother was dying of cancer. Desperate to save her, Guerrero took his mother to clinics in Mexico before getting that approval. She died there in August, and he's been stuck since then. The U.S granted his request to return Tuesday. When his mother's cancer treatments were failing in the U.S., Guerrero found clinics offering alternative treatments in Mexico and took his mother across the border, hoping to keep her alive. In doing so, he knowingly broke a rule by leaving the U.S. without federal authorization. How big an issue is immigration in the midterms? "He panicked. His dad and mom wanted him to go, and he did the best thing he thought he could do for his family," said his lawyer Alan Klein. Guerrero had lived in the United States illegally since he was 2. 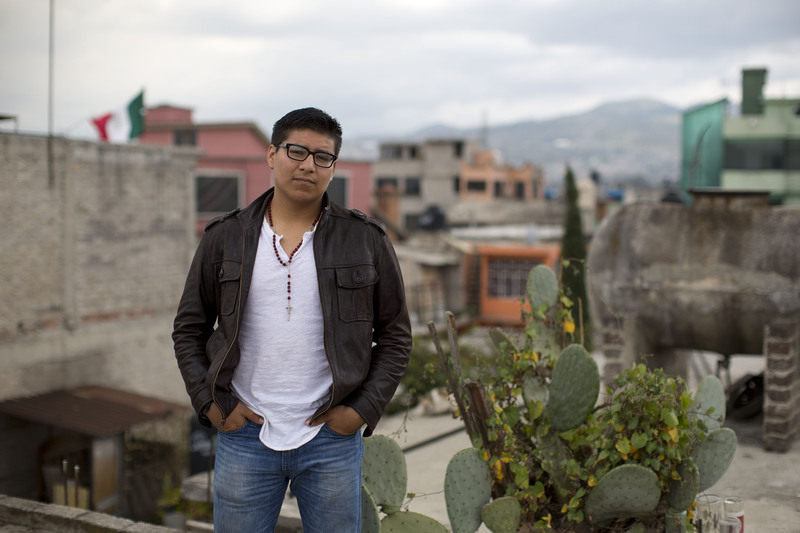 His parents brought him from Mexico City to California, and they overstayed tourist visas. He breezed through school, earning a scholarship to a John Hopkins University summer school program at 13. Eventually, along with hundreds of thousands of other young immigrants, Guerrero was granted a temporary reprieve from the threat of deportation under a 2012 Obama administration order. The catch: If these immigrants ever leave the U.S. without government approval, they lose their protected status. Guerrero was at his mother's side when she died weeks later. But then, instead of cramming for exams in Cambridge, Massachusetts, the film studies major was stuck at his grandparents' house in a gang-controlled suburb of Mexico City, hoping to persuade the U.S. government to let him come home. Guerrero's initial re-entry request was denied, so then Klein requested a special "humanitarian parole," which the government grants "based on urgent humanitarian reasons or if there is a significant public benefit," according to the U.S. Citizenship and Immigration Service website. Agency officials declined to discuss any details of Guerrero's case because it is ongoing. However, spokesman Chris Bentley said "Immigration law is complex; anyone considering taking an immigration action needs to clearly understand the potential consequences of that action first." Guerrero told The Associated Press that he submitted two requests for fast-tracked permission to leave while his mother's health declined, and was asked to more fully document his mother's medical condition. He could have tried to plead his case in person, but he left instead before getting an answer. "My mom had a lot of ups and downs," he said. "The decision to actually leave was made overnight." Guerrero says he regrets his rash decision most of all because he thinks his mother would have been happier living her final days in Southern California with her husband and children, "but then we still had hope -- and if we delayed that treatment any longer because of immigration issues, I don't think I would have been able to forgive myself."